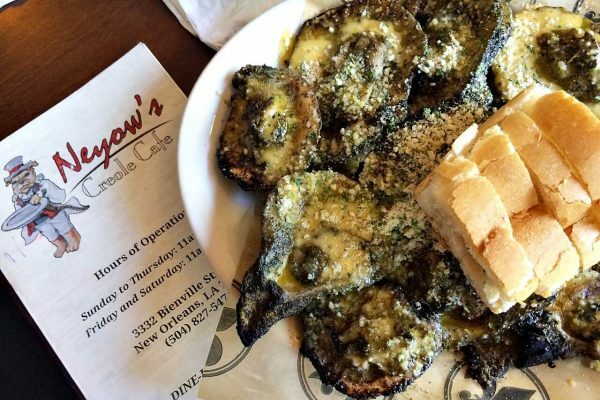 There’s nothing like New Orleans when it comes to festivals and merrymaking. Walk around the French Quarter and you’ll inevitably see a parade or, if you’re lucky, a second line. Where in most cities street jazz musicians perform singly, in New Orleans you see them in groups, and there is nothing sweeter than hearing jazz music as you walk along Bourbon St. More than any other festival, however, my favorite is Halloween in New Orleans. It is indeed a very special time in the Crescent City. 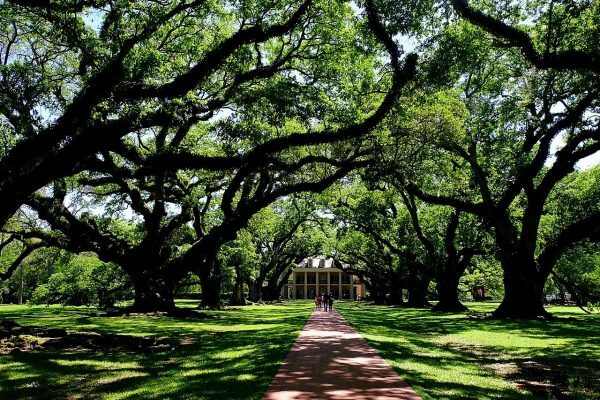 Here are a few reasons why you should go to New Orleans for Halloween. One of the many elaborately-costumed couples during Halloween. First off, New Orleanians are not shy about dressing up. Give them a slight reason to be in costume and they’ll show up with full make-up, wigs, and period dresses. Most come with partners or with friends, but some do go solo. Just put on your favorite character and walk around the French Quarter. You’ll inevitably meet people you can hang out there. No costume? No problem! Just walk around the French Quarter and you’ll see a lot of shops selling costumes. Once you’ve had your first beignet at Cafe Du Monde along Decatur St., for example, head to the shops on the same street. It’s great to celebrate Halloween with friends! 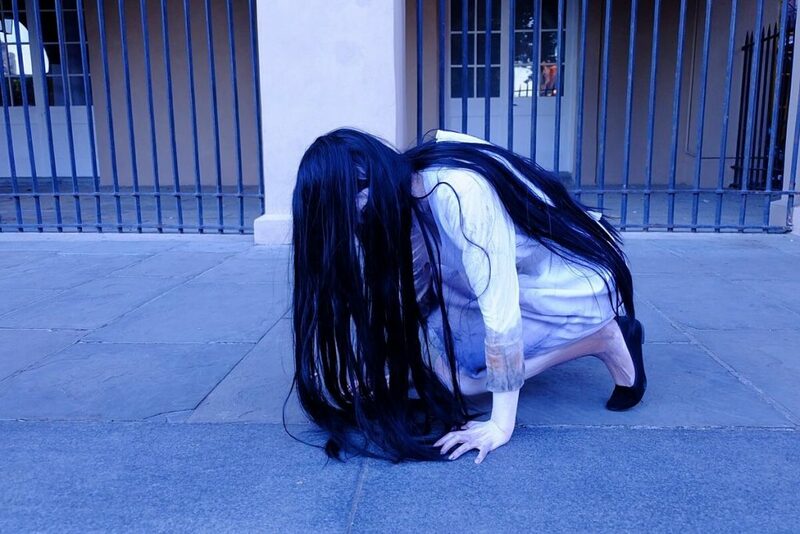 Full disclosure: While I did go around the French Quarter every day during Halloween week, I didn’t put on a costume. I would have wanted to dress up as my sorcerer character in Dungeons & Dragons, but I’m too shy to randomly strike up a conversation with strangers. For introverts like me, a New Orleans Halloween is definitely best celebrated with friends! In case nights can get wild, make sure you have travel insurance for the United States before you come. Don’t be too shy to ask to take their pics. 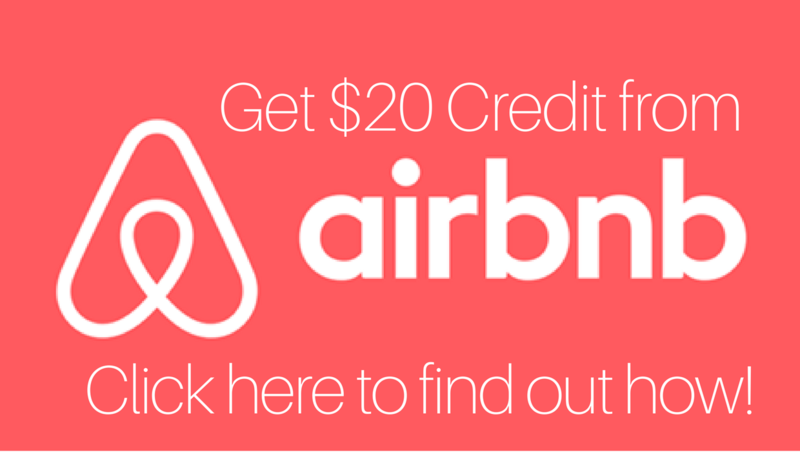 Did you know that New Orleans is well-known for voodoo? It is an Afro-American religion brought to Louisiana in the early 1700s by enslaved West Africans during the French occupation. They brought their cultural practices and religious beliefs with them, rooted in spirit and ancestor worship, including their knowledge and skills of creating charms and amulets for protection or harming others. The most famous voodoo practitioner in New Orleans is Marie Laveau, the “Voodoo Queen,” whose grave you’ll see when you take the St. Louis Cemetery tour (see below). Note that there are two voodoo festivals in New Orleans. One is the Voodoo Music + Arts Experience happening on October 26-28 at City Park. It’s several days of great music and arts featuring several well-known musicians. Those who have performed here in the past include Metallica, Stone Temple Pilots, Pearl Jam, KISS, Eminem, Neil Young, Snoop Dogg, Duran Duran, The Smashing Pumpkins, 50 Cent, No Doubt, Ozzy Osbourne, and famous Louisiana musicians like The Preservation Hall Jazz Band, among others. The other Voodoo Fest is a free event held every Halloween by Voodoo Authentica. It celebrates the Voodoo religion by educating the public about Voodoo; there will be priests holding presentations and talking about the spirits of the Voodoo pantheon. 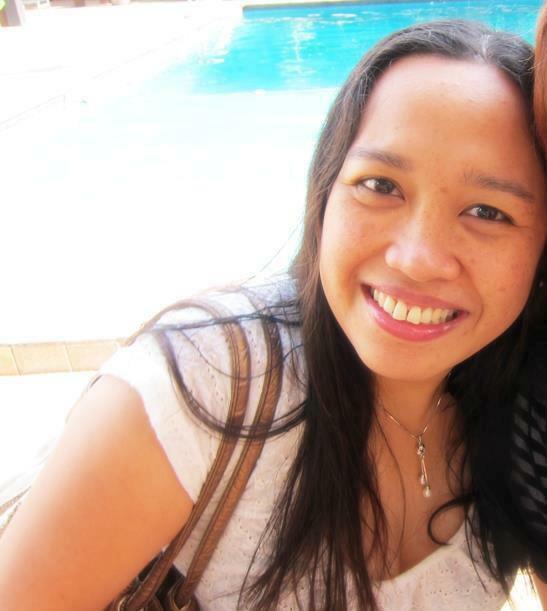 At the 6-hour event, there will be book signings and spiritual consultations. You can also buy potions, oils, and gris gris bags (talismans for good luck or protection from evil), as well as handmade voodoo dolls. The festival will be closed with an ancestral healing ritual. The infamous LaLaurie house in the French Quarter. When you look at a map of New Orleans, you’ll notice that there a lot of cemeteries scattered around the city. There are three cemeteries named St. Louis alone, three St. Patricks, and two Lafayettes. Predictably, cemeteries are included in New Orleans’ tourist attractions. 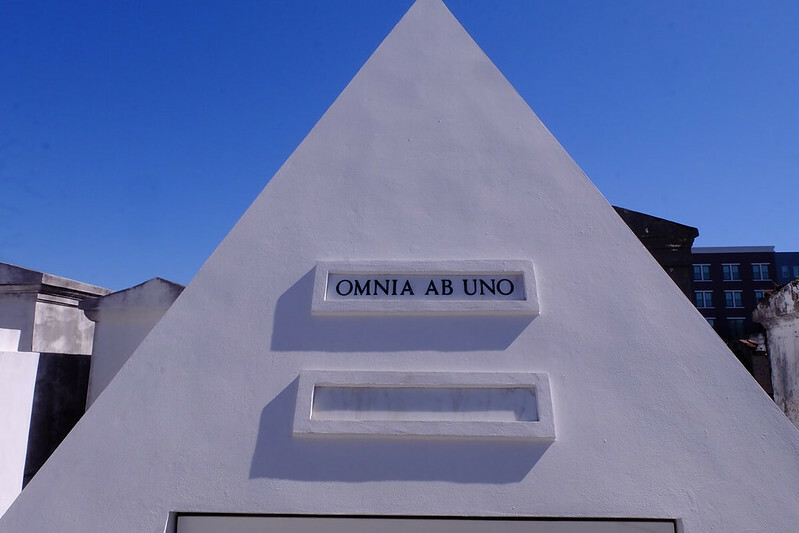 The most well-known cemetery is St. Louis Cemetery #1 not only because of its proximity to the French Quarter and downtown (walking distance from Canal St.), but also because Marie Laveau was buried here. Believers leave offerings at her tomb, praying for blessings. 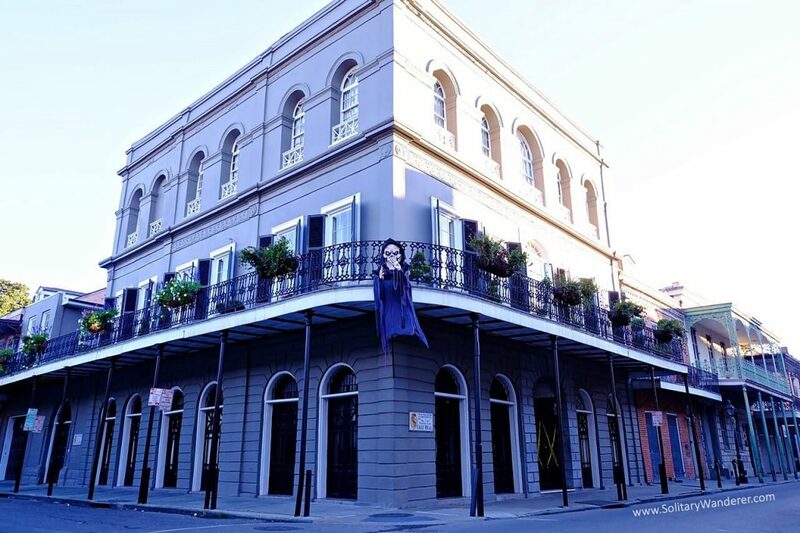 The infamous Madame LaLaurie, a New Orleans Creole socialite who was known for torturing and murdering slaves in her home, was also said to have been buried here, although her time of death remains a controversy. Want to see where the Hollywood actor Nicolas Cage will be buried when he dies? He already bought a pyramid-shaped tomb at St. Louis #1. It stands empty at the moment, of course! Note that St. Louis Cemetery No. 1 is closed to the tourists and the general public unless accompanied by a licensed tour guide. Tomb owners get a free pass. This is actor Nicolas Cage’s tomb, kept vacant until he needs it. Like any old city, New Orleans has its share of ghost stories. There is no better time to listen to them than during Halloween! As I wanted something different, I chose a skeptic’s ghost tour. It’s basically the same as any other ghost tour; the guide will take you to houses with well-known ghost sightings and tell you what happened there. What makes it different is that they will tell you the truth about each ghost story. After all, if I just wanted to hear about ghost stories in New Orleans, I can just Google them. What’s not easy to find out is the real stories behind what seems like urban legends already. If you’re a believer in ghosts, you might want to skip this tour. One of the many houses Uptown decorated for Halloween. 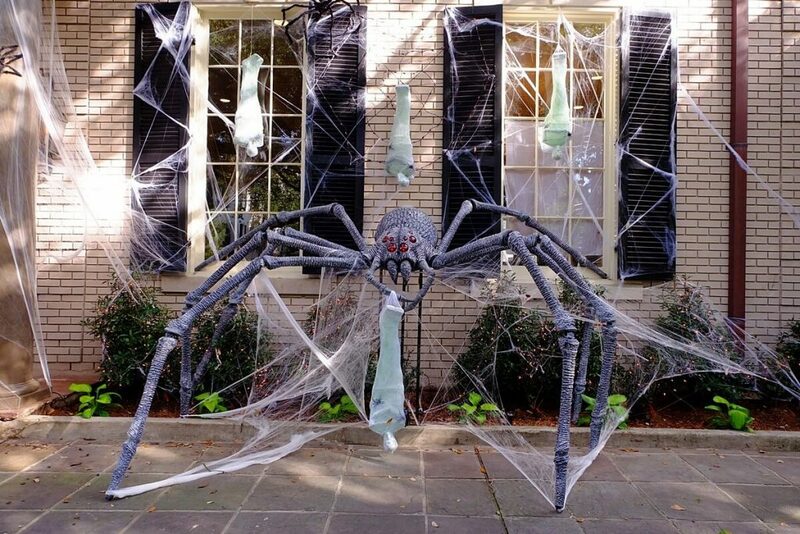 It’s not only people that get decked out during Halloween in New Orleans, the houses get on in the fun, too. 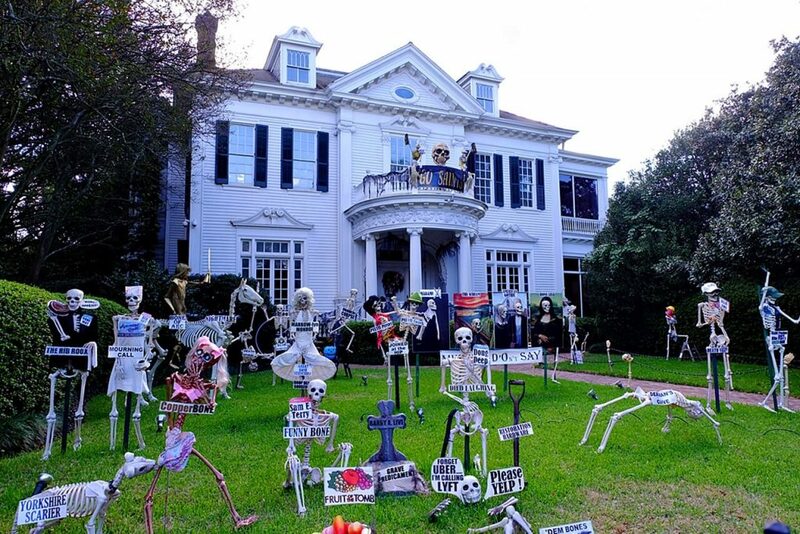 If you want to see scarily-decorated mansions, head to the Garden District. Just take the green streetcar that runs through St. Charles Avenue and get off at State Street. From there, walk around and see how grand the houses are, even with skeletons and ghosts hanging from trees. My favorite is the huge house at the corner of State and St. Charles (featured photo). Can you see the captions on the skeletons? You have Sam E. Terry, Obstacle Corpse, Marrow-Lyn Monroe, Bone of Arc, and more. 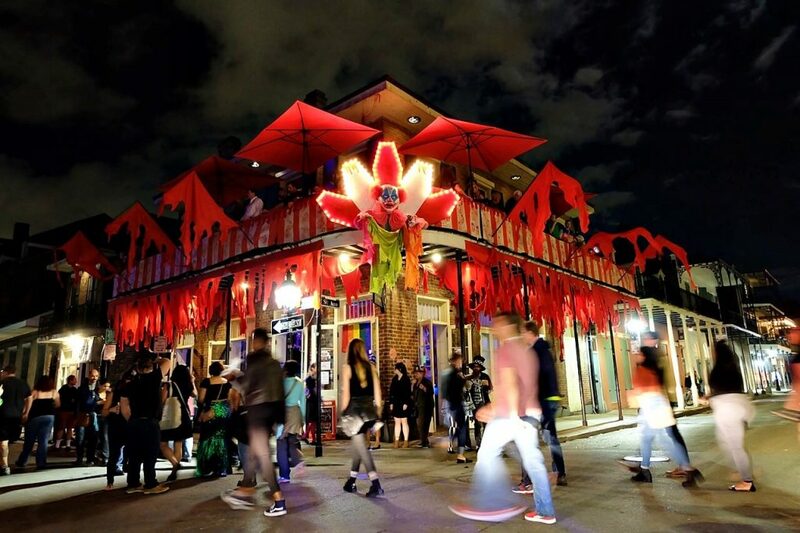 The French Quarter is the place to be during Halloween. 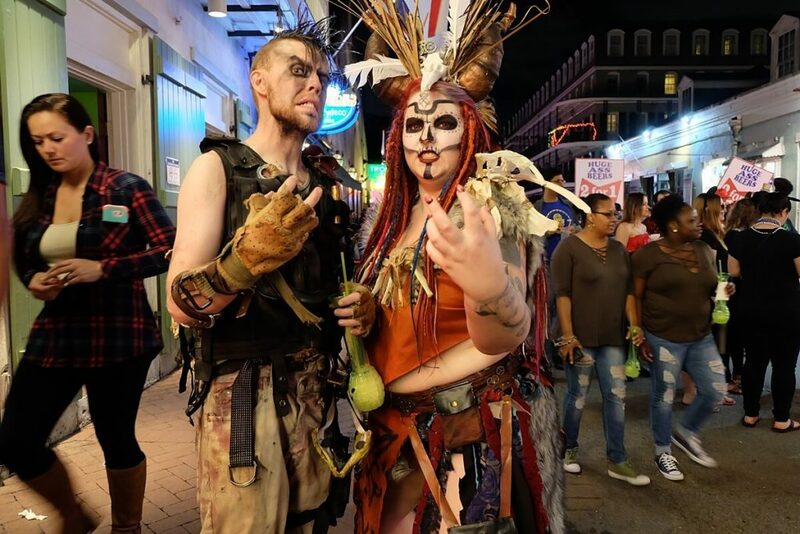 Halloween in New Orleans is made all the more special because of the LGBT community. They go out in full costume and you can join in the fun. The street parties are usually held along Bourbon St. or St. Ann, and the proceeds from the event will be donated to a shelter for people living with AIDS. Of course, New Orleans wouldn’t be New Orleans without the floats. The Krewe of Boo will have its Halloween-themed parade on October 20, featuring gorgeous floats that are elaborately designed in keeping with the theme. Mardi Gras beads and other throws are collectible or consumable, including candies, pralines, voodoo doll pins and magnets, among others. The parade starts at Marigny, but you can just wait at Jackson Square. With the street musicians there, and the various artwork on display, you’ll have plenty to occupy your time before the parade arrives. So if you’re planning a visit to Louisiana, make sure to time it well so you can celebrate Halloween in New Orleans. It’s such a vibrant city with so many things to do, and if you can’t go during Mardi Gras season, Halloween is the next best thing. 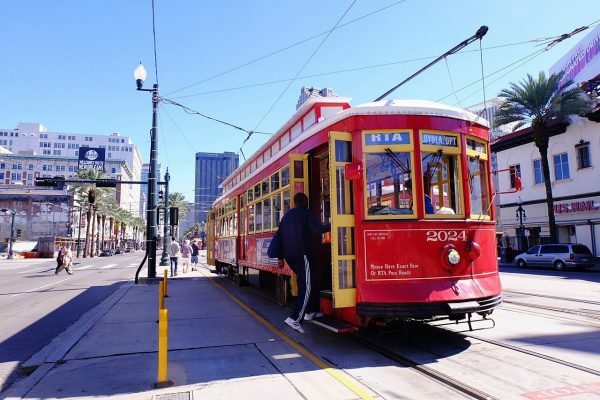 Whether you’ll go as a participant or an observer (like me), you’ll definitely enjoy the joie de vivre that is New Orleans! Where have you celebrated Halloween? Do share in the comments section below. Hi Aleah, I like this article since I haven’t been to New Orleans. Gonna be on my bucket list. Thanks. I’ve always wanted to visit New Orleans during Halloween…definitely on my bucket list. Looks so fun! Let me know when you get back there, because just like you I want to go back and prolly go to Baton Rouge too. I love it there and hope to go back next year! LOL on those Hooters ladies hahaha! Funny as can be. New Orleans is about the best place on earth to celebrate Halloween. Big time fun vibe, anything goes and you’ll never see more colorful costumes. Rocking post. New Orleans really surprised me. I didn’t know I would love it so much.